2011-03-30 Assigned to DOW GLOBAL TECHNOLOGIES LLC reassignment DOW GLOBAL TECHNOLOGIES LLC CHANGE OF NAME (SEE DOCUMENT FOR DETAILS). Assignors: DOW GLOBAL TECHNOLOGIES INC.
2011-09-22 Assigned to DOW GLOBAL TECHNOLOGIES LLC reassignment DOW GLOBAL TECHNOLOGIES LLC ASSIGNMENT OF ASSIGNORS INTEREST (SEE DOCUMENT FOR DETAILS). Assignors: KONZE, WAYDE V., VANDERLENDE, DANIEL D.
2018-07-20 First worldwide family litigation filed litigation Critical https://patents.darts-ip.com/?family=38572813&utm_source=google_patent&utm_medium=platform_link&utm_campaign=public_patent_search&patent=US8058373(B2) "Global patent litigation dataset” by Darts-ip is licensed under a Creative Commons Attribution 4.0 International License. A process for polymerization of propylene, optionally ethylene, and further optionally one or more C4-30 α-olefins and/or one or more conjugated or nonconjugated dienes under continuous, solution polymerization conditions to prepare a high molecular weight polymer or interpolymer, said process comprising conducting the polymerization in the presence of a catalyst composition comprising a hafnium complex of a polyvalent aryloxyether. This application claims the benefit of U.S. Provisional Application 60/801,182, filed May 17, 2006. Catalyst compositions based on well defined donor ligand containing metal complexes, referred to as post-metallocene complexes have been shown to give products having narrow molecular weight distribution and high molecular weights. However, these catalysts often have poor high temperature stability and suffer from poor catalytic efficiencies, especially at elevated polymerization temperatures. When employed to prepare propylene containing polymers, especially polypropylene, propylene/ethylene copolymers, and ethylene/propylene rubber (EP) modified polypropylene, the resulting polymer tacticity, molecular weight and catalyst efficiency are often deficient. Examples of the foregoing post metallocene catalysts are disclosed in U.S. Pat. No. 6,827,976 and US2004/0010103, where Group 3-6 or Lanthanide metal complexes, preferably Group 4 metal complexes, of bridged divalent aromatic ligands containing a divalent Lewis base chelating group are disclosed for use in olefin polymerizations. Higher solution reaction temperatures are particularly desired for propylene polymerizations in order to reduce energy consumption and improve operating efficiency. However, the use of higher reaction temperatures often results in poor conversions, lower polymer molecular weight, and reduced polymer tacticity. Accordingly, selection of catalyst compositions capable of formation of isotactic polypropylene at increased efficiency at elevated reaction temperatures is highly desired. We have now discovered that certain metal complexes may be employed in a highly efficient solution polymerization process to prepare propylene polymers, including propylene homopolymers and copolymers of propylene with one or more comonomers. We have also discovered that a continuous process can be employed to prepare the foregoing propylene polymers in increased yield and efficiency. In particular, the present inventors have discovered an improved continuous solution polymerization process for preparing such polymers that is characterized by high polymerization efficiency and productivity. According to the present invention there is now provided a process for homopolymerization of propylene and/or the copolymerization of propylene with ethylene, and optionally one or more C4-30 α-olefins and/or one or more conjugated or nonconjugated dienes under continuous, high temperature, solution polymerization conditions to prepare a high molecular weight interpolymer using a catalyst composition comprising a Group 4 metal complex of a polyvalent aryloxyether. The present invention is particularly advantageous for use under continuous solution polymerization conditions wherein a reaction mixture comprising a metal complex, an activating cocatalyst or cocatalyst mixture, and optionally a chain transfer agent, along with propylene, optionally ethylene, and further optionally one or more C4-30 α-olefins and/or conjugated or nonconjugated dienes are continuously added to a reactor operating under solution polymerization conditions, and polymer product is continuously or semi-continuously removed therefrom. By use of temperatures sufficiently high to retain the polymer formed in solution, rather than in the form of a slurry of solid particles, improved efficiency of operation is realized. Moreover, by operation at a combination of high propylene monomer conversion and high reactor dissolved polymer (solids) content, residual propylene monomer may be retained in the effluent and recycle streams of the reactor, avoiding the use of separate monomer recycle techniques and equipment. For example, cooling, condensing and recycling of propylene monomer is practically eliminated by operation under the present high temperature conditions whereby sufficient monomer solubility in the reaction mixture is achieved. In one embodiment, the present process comprises polymerizing propylene, optionally ethylene, and further optionally a conjugated or nonconjugated diolefin using a hafnium complex under continuous, solution polymerization conditions at a temperature from 120 to 250° C., preferably from 130 to 200° C., more preferably 140 to 200° C., under high propylene conversion conditions (>75 percent, preferably >85 percent) to prepare a polymer comprising, in polymerized form, from 70 to 100, preferably 80 to 100, more preferably 85 to 98 percent propylene, 30 to 0, preferably 20 to 0, more preferably 15 to 2 percent ethylene, and 0 to 10, preferably 0 to 8, more preferably 0 to 7.5 percent α-olefin. In another embodiment of the invention, propylene/ethylene copolymers containing from 85 to 98 weight percent propylene and having Mw of 50,000 g/mol or higher are prepared in a continuous solution polymerization process operating at a temperature from 120 to 250° C., preferably from 130 to 250° C., with a propylene concentration in the reactor of 8 percent or less, and a solids content of the reaction mixture of 15 percent or greater. The present invented process is particularly advantageous for use under polymerization conditions wherein a reaction mixture comprising metal complex, activating cocatalyst, propylene, optionally ethylene, and further optionally a conjugated or nonconjugated diene is continuously or intermittently added to a reactor operating under solution polymerization conditions, optionally in the additional presence of a chain transfer agent, and polymerized product is continuously or semi-continuously removed therefrom by devolatilization of the reaction mixture, wherein a majority of the unreacted propylene in the reaction mixture is retained in the liquid components after devolatilization and not separated therefrom prior to recycle. In a preferred embodiment, substantially all of the unreacted propylene monomer of the reaction mixture is retained in the liquid components after devolatilization and not separated therefrom prior to recycle. The invention is particularly suitable for production of resins that are used in the preparation of adhesives, films and molded or extruded articles for packaging, automotive, and consumer durables applications. The polymers preferably are elastomers in which the propylene sequences possess a relatively high isotacticity, making the products ideally suited for higher temperature applications, especially adhesives for uses where higher service temperatures are encountered. All references to the Periodic Table of the Elements herein shall refer to the Periodic Table of the Elements, published and copyrighted by CRC Press, Inc., 2003. Also, any references to a Group or Groups shall be to the Group or Groups reflected in this Periodic Table of the Elements using the IUPAC system for numbering groups. Unless stated to the contrary, implicit from the context, or customary in the art, all parts and percents are based on weight and all test methods are current as of the filing date hereof. For purposes of United States patent practice, the contents of any patent, patent application, or publication referenced herein are hereby incorporated by reference in their entirety (or the equivalent US version thereof is so incorporated by reference) especially with respect to the disclosure of synthetic techniques, definitions (to the extent not inconsistent with any definitions provided herein) and general knowledge in the art. The term “comprising” and derivatives thereof is not intended to exclude the presence of any additional component, step or procedure, whether or not the same is disclosed herein. In order to avoid any doubt, all compositions claimed herein through use of the term “comprising” may include any additional additive, adjuvant, or compound whether polymeric or otherwise, unless stated to the contrary. In contrast, the term, “consisting essentially of” excludes from the scope of any succeeding recitation any other component, step or procedure, excepting those that are not essential to operability. The term “consisting of” excludes any component, step or procedure not specifically delineated or listed. The term “or”, unless stated otherwise, refers to the listed members individually as well as in any combination. As used herein with respect to a chemical compound, unless specifically indicated otherwise, the singular includes all isomeric forms and vice versa (for example, “hexane”, includes all isomers of hexane individually or collectively). The terms “compound” and “complex” are used interchangeably herein to refer to organic-, inorganic- and organometal compounds. The term, “atom” refers to the smallest constituent of an element regardless of ionic state, that is, whether or not the same bears a charge or partial charge or is bonded to another atom. 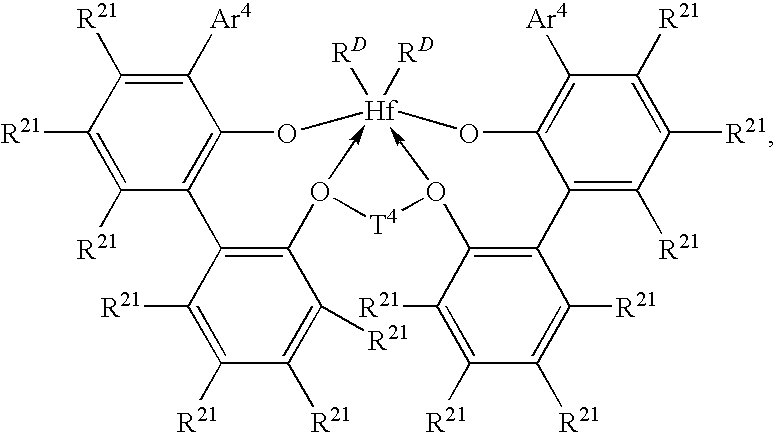 The term “heteroatom” refers to an atom other than carbon or hydrogen. Preferred heteroatoms include: F, Cl, Br, N, O, P, B, S, Si, Sb, Al, Sn, As, Se and Ge. The term “amorphous” refers to a polymer lacking a crystalline melting point as determined by differential scanning calorimetry (DSC) or equivalent technique. The term, “hydrocarbyl” refers to univalent substituents containing only hydrogen and carbon atoms, including branched or unbranched, saturated or unsaturated, cyclic, polycyclic or noncyclic species. Examples include alkyl-, cycloalkyl-, alkenyl-, alkadienyl-, cycloalkenyl-, cycloalkadienyl-, aryl-, and alkynyl-groups. “Substituted hydrocarbyl” refers to a hydrocarbyl group that is substituted with one or more nonhydrocarbyl substituent groups. The terms, “heteroatom containing hydrocarbyl” or “heterohydrocarbyl” refer to univalent groups in which at least one atom other than hydrogen or carbon is present along with one or more carbon atom and one or more hydrogen atoms. The term “heterocarbyl” refers to groups containing one or more carbon atoms and one or more heteroatoms, but no hydrogen atoms. The bond between the carbon atom and any heteroatom as well as the bonds between any two heteroatoms, may be a single or multiple covalent bond or a coordinating or other donative bond. Thus, an alkyl group substituted with a heterocycloalkyl-, aryl-substituted heterocycloalkyl-, heteroaryl-, alkyl-substituted heteroaryl-, alkoxy-, aryloxy-, dihydrocarbylboryl-, dihydrocarbylphosphino-, dihydrocarbylamino-, trihydrocarbylsilyl-, hydrocarbylthio-, or hydrocarbylseleno-group is within the scope of the term heteroalkyl. Examples of specific heteroalkyl groups include cyanomethyl-, benzoylmethyl-, (2-pyridyl)methyl-, and trifluoromethyl-groups. As used herein the term “aromatic” refers to a polyatomic, cyclic, conjugated ring system containing (4δ+2) π-electrons, wherein δ is an integer greater than or equal to 1. The term “fused” as used herein with respect to a ring system containing two or more polyatomic, cyclic rings means that with respect to at least two rings thereof, at least one pair of adjacent atoms is included in both rings. The term “aryl” refers to a monovalent aromatic substituent which may be a single aromatic ring or multiple aromatic rings which are fused together, linked covalently, or linked to a common group such as a methylene or ethylene moiety. 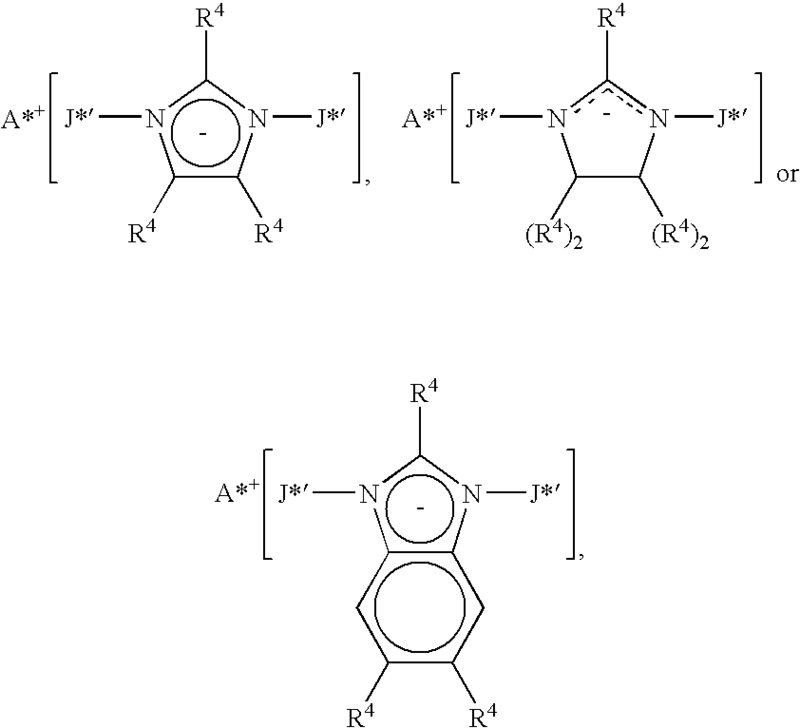 Examples of aromatic ring(s) include phenyl, naphthyl, anthracenyl, and biphenyl, among others. “Substituted aryl” refers to an aryl group in which one or more hydrogen atoms bound to any carbon is replaced by one or more functional groups such as alkyl, substituted alkyl, cycloalkyl, substituted cycloalkyl, heterocycloalkyl, substituted heterocycloalkyl, halogen, alkylhalos (for example, CF3), hydroxy, amino, phosphido, alkoxy, amino, thio, nitro, and both saturated and unsaturated cyclic hydrocarbons which are fused to the aromatic ring(s), linked covalently or linked to a common group such as a methylene or ethylene moiety. The common linking group may also be a carbonyl as in benzophenone, or oxygen as in diphenylether, or nitrogen as in diphenylamine. The term “polymer” as used herein refers to a macromolecular compound prepared by polymerizing one or more monomers. A polymer refers to homopolymers, copolymers, terpolymers, interpolymers, and so on. The term “interpolymer” is used herein interchangeably with the term copolymer to refer to polymers incorporating in polymerized form at least two copolymerizable monomers, or incorporating long chain branching as a result of chain termination/olefin formation reactions in situ, and reincorporation of the in situ formed olefin. Accordingly, copolymers may result from the polymerization of a single monomer, under the correct operating conditions. The least prevalent monomer or monomers in the resulting interpolymer are generally referred to by the term “comonomer”. The chain length of the resulting long chain branches referred to above, is consequently longer than the carbon length resulting from polymerization of any deliberately added comonomer, and in particular, is longer than 1 carbon for propylene/ethylene copolymers. The presence of long chain branching may also be detected by the increased shear sensitivity of the polymer, as disclosed in EP-A-608,369, and elsewhere, or determined by Melt Index Ratio (MIR), a ratio of polymer melt viscosities measured under differing loads, especially I21/I2. Differential scanning calorimetry (DSC) is a common technique that can be used to examine the melting and crystallization of semi-crystalline polymers. General principles of DSC measurements and applications of DSC to studying semi-crystalline polymers are described in standard texts (for instance, E. A. Turi, ed., “Thermal Characterization of Polymeric Materials”, Academic Press, 1981). The term “crystallinity” as used herein refers to means the regularity of the arrangement of atoms or molecules forming a crystal structure. Polymer crystallinity can be examined using DSC. Tme means the temperature at which the melting ends and Tmax means the peak melting temperature, both as determined by one of ordinary skill in the art from DSC analysis using data from the final heating step. One suitable method for DSC analysis uses a model Q1000™ DSC from TA Instruments, Inc. Calibration of the DSC is performed in the following manner. First, a baseline is obtained by heating the cell from −90° C. to 290° C. without any sample in the aluminum DSC pan. Then 7 milligrams of a fresh indium sample is analyzed by heating the sample to 180° C., cooling the sample to 140° C. at a cooling rate of 10° C./min followed by keeping the sample isothermally at 140° C. for 1 minute, followed by heating the sample from 140° C. to 180° C. at a heating rate of 10° C./min. The heat of fusion and the onset of melting of the indium sample are determined and checked to be within 0.5° C. from 156.6° C. for the onset of melting and within 0.5 J/g from 28.71 J/g for the heat of fusion. Then deionized water is analyzed by cooling a small drop of fresh sample in the DSC pan from 25° C. to −30° C. at a cooling rate of 10° C./min. The sample is kept isothermally at −30° C. for 2 minutes and heated to 30° C. at a heating rate of 10° C./min. The onset of melting is determined and checked to be within 0.5° C. from 0° C.
Samples of polymer are pressed into a thin film at a temperature of 190° C. About 5 to 8 mg of sample is weighed out and placed in a DSC pan. A lid is crimped on the pan to ensure a closed atmosphere. The sample pan is placed in the DSC cell and then heated at a high rate of about 100° C./min to a temperature of about 30° C. above the polymer melt temperature. The sample is kept at this temperature for about 3 minutes. Then the sample is cooled at a rate of 10° C./min to −40° C., and kept isothermally at that temperature for 3 minutes. Consequently the sample is heated at a rate of 10° C./min until melting is complete. The resulting enthalpy curves are analyzed for peak melt temperature, onset and peak crystallization temperatures, heat of fusion and heat of crystallization, Tme, Tmax, and any other quantity of interest from the corresponding thermograms as described in U.S. Pat. No. 6,960,635. The factor that is used to convert heat of fusion into nominal weight percent crystallinity is 165 J/g=100 weight percent crystallinity. With this conversion factor, the total crystallinity of a propylene-based copolymer (units: weight percent crystallinity) is calculated as the heat of fusion divided by 165 J/g and multiplied by 100 percent. “Mer unit” means that portion of a polymer derived from a single reactant molecule; for example, a mer unit from ethylene has the general formula —CH2CH2—. “Polypropylene” or “propylene polymer” means a polymer having at least half of its mer units derived from propylene. These include homopolymers of propylene as well as copolymers of propylene with one or more monomers copolymerizable therewith such as ethylene, 1-butene, 1-pentene, 1-hexene, 1-octene, one or more conjugated or non-conjugated dienes, and combinations thereof. “Isotactic polymer” refers to polymers of C3 or higher α-olefins having a regular pattern in the stereochemical arrangement of side groups, in which all side chains are on the same side of the polymer backbone. The structure may be described based on 13C NMR analysis using Bovey's NMR nomenclature for an isotactic pentad, by mmmm, with each “m” representing a “meso” dyad or successive alkyl groups on the same side of the polymer plane. Inversions due to monomer insertion in non-isotactic manner or other defects in the structure of the chain lowers the degree of isotacticity as well as the crystallinity of the polymer. Preferred isotactic polymers have a chain isotacticity pentad index of at least about 80 mol percent, preferably greater than 95 mol percent. Isotactic polypropylene additionally desirably is characterized by a n-heptane soluble content of less than 15 percent by weight, and a density of about 0.902 grams/cm3 measured according to ASTM D1505-96 (“Density of Plastics by the Density-Gradient Technique”). The term “crystalline” is used herein to mean a polymer having a crystalline melting point as determined by DSC analysis. Polymerization conditions generally refer to temperature, pressure, monomer content (including comonomer concentration), catalyst concentration, cocatalyst concentration, monomer conversion, polymer (or solids) content of the reaction mixture or other conditions that influence the properties of the resulting polymer. By operation according to the prescribed polymerization conditions of the invention, high molecular weight polymers may be prepared with high catalyst activities, low cocatalyst usage, high monomer conversion, and high reactor solids content. In particular, activities (based on weight of polymer to weight of transition metal) greater than 0.5 g/μg, preferably greater than 0.55 g/μg, and even greater than 0.6 g/μg are possible. Embodiments of the invention provide a new solution process for making propylene homopolymers and ethylene/propylene rubber modified propylene interpolymers using a catalyst composition comprising a transition metal complex as previously disclosed at high temperature, high catalyst efficiency and high propylene monomer conversion. Highly desirably, the produced polymers are of high molecular weight (MI<10.0, preferably <5.0). Such polymers are suitably employed where improved high temperature performance is desired, such as in molding and extrusion grades of polypropylene especially for use as extruded films and profiles or for the manufacture of molded parts. Polymer weight-average molecular weight (Mw) is measured by gel permeation chromatography, one technique of which as described in U.S. Pat. No. 5,272,236. Alternatively, melt index, I2, I10 or I21, measured, for example, according to ASTM D-1238 may be employed as an indication of molecular weight. Generally, melt index is inversely related to the molecular weight of the polymer. The higher the molecular weight, the lower the melt index, although the relationship is not necessarily linear. Finally, Mooney viscosity (ML 1+4 @ 100° C.) may be used as a measure of molecular weight. Preferred polymers are those having a Mooney viscosity in the range from 10 to 135, more preferably from 25 to 100, and most preferably from 30 to 80. Monomer conversion is typically measured by GC or IR spectroscopic analysis of the reaction mixture exiting the reactor using a probe inserted into the reactor or into an effluent stream from the reactor. Surprisingly, the present metal complexes are capable of producing polymers from propylene or propylene containing monomer mixtures having extremely high molecular weight and isotacticity, at catalyst efficiencies of greater than 0.5 gpolymer/μgmetal, thereby allowing the use of a chain transfer agent to control molecular weight without sacrificing molecular weight distribution. A sufficient quantity of chain transfer agent is preferably used so that a substantial decrease in molecular weight (>30 percent) occurs compared to a comparative polymerization without the use of chain transfer agent. When the chain transfer agent is hydrogen, at least 0.01 mol percent (based on propylene) is used, and a maximum of about 2 mol percent is used. Especially surprising is the fact that highly isotactic polymers can be prepared with high levels of chain transfer agents, while still affording narrow molecular weight distribution polymers and using low levels of alumoxane activators. Generally, use of high levels of chain transfer agent with conventional catalysts results in production of polymers having broadened molecular weight distributions. The metal complexes are activated in various ways to yield catalyst compounds having a vacant coordination site that will coordinate, insert, and polymerize addition polymerizable monomers, especially olefin(s). For the purposes of this patent specification and appended claims, the term “activator” or “cocatalyst” is defined to be any compound or component or method which can activate the metal complex in the foregoing manner. Non-limiting examples of suitable activators include Lewis acids, non-coordinating ionic activators, ionizing activators, organometal compounds, and combinations of the foregoing substances capable of converting the neutral metal complex to a catalytically active species. It is believed, without desiring to be bound by such belief, that in one embodiment of the invention, catalyst activation may involve formation of a cationic, partially cationic, or zwitterionic species, by means of proton transfer, oxidation, or other suitable activation process. It is to be understood that the present invention is operable and fully enabled regardless of whether or not such an identifiable cationic, partially cationic, or zwitterionic species actually results during the activation process, also interchangeably referred to herein as an “ionization” process or “ionic activation process”. Ionizing cocatalysts may contain an active proton, or some other cation associated with, but not coordinated to or only loosely coordinated to, an anion of the ionizing compound. Such compounds are described in European publications EP-A-570982, EP-A-520732, EP-A-495375, EP-A-500944, EP-A-277 003 and EP-A-277004, and U.S. Pat. Nos. 5,153,157, 5,198,401, 5,066,741, 5,206,197, 5,241,025, 5,384,299 and 5,502,124. Preferred among the foregoing activators are ammonium cation containing salts, especially those containing trihydrocarbyl-substituted ammonium cations containing one or two C10-40 alkyl groups, especially methylbis(octadecyl)-ammonium- and methylbis(tetradecyl)-ammonium-cations and a non-coordinating anion, especially a tetrakis(perfluoro)arylborate anion, especially tetrakis(pentafluorophenyl)borate. It is further understood that the cation may comprise a mixture of hydrocarbyl groups of differing lengths. For example, the protonated ammonium cation derived from the commercially available long-chain amine comprising a mixture of two C14, C16 or C18 alkyl groups and one methyl group. Such amines are available from Chemtura Corp., under the trade name Kemamine™ T9701, and from Akzo-Nobel under the trade name Armeen™ M2HT. A most preferred ammonium salt activator is methyldi(C14-20alkyl)ammonium tetrakis(pentafluorophenyl)borate. Activation methods using ionizing ionic compounds not containing an active proton but capable of forming active catalyst compositions, such as ferrocenium salts of the foregoing non-coordinating anions are also contemplated for use herein, and are described in EP-A426637, EP-A-573403 and U.S. Pat. No. 5,387,568. Also included is the use of strong Lewis acids, especially tris(perfluoro)aryl borane compounds, such as tris(pentafluorophenyl)borane, which are capable of abstraction of a ligand groups, especially a hydrocarbyl ligand, thereby forming a non-coordinating counter anion for the cationic derivative of the metal complex. J*′ is tris(pentafluorophenyl)borane or tris(pentafluorophenyl)alumane). bis(tris(pentafluorophenyl)borane)imidazolide, bis(tris(pentafluorophenyl)borane)-2-undecylimidazolide, bis(tris(pentafluorophenyl)borane)-2-heptadecylimidazolide, bis(tris(pentafluorophenyl)borane)-4,5-bis(undecyl)imidazolide, bis(tris(pentafluorophenyl)borane)-4,5-bis(heptadecyl)imidazolide, bis(tris(pentafluorophenyl)borane)imidazolinide, bis(tris(pentafluorophenyl)borane)-2-undecylimidazolinide, bis(tris(pentafluorophenyl)borane)-2-heptadecylimidazolinide, bis(tris(pentafluorophenyl)borane)-4,5-bis(undecyl)imidazolinide, bis(tris(pentafluorophenyl)borane)-4,5-bis(heptadecyl)imidazolinide, bis(tris(pentafluorophenyl)borane)-5,6-dimethylbenzimidazolide, bis(tris(pentafluorophenyl)borane)-5,6-bis(undecyl)benzimidazolide, bis(tris(pentafluorophenyl)alumane)imidazolide, bis(tris(pentafluorophenyl)alumane)-2-undecylimidazolide, bis(tris(pentafluorophenyl)alumane)-2-heptadecylimidazolide, bis(tris(pentafluorophenyl)alumane)-4,5-bis(undecyl)imidazolide, bis(tris(pentafluorophenyl)alumane)-4,5-bis(heptadecyl)imidazolide, bis(tris(pentafluorophenyl)alumane)imidazolinide, bis(tris(pentafluorophenyl)alumane)-2-undecylimidazolinide, bis(tris(pentafluorophenyl)alumane)-2-heptadecyl imidazolinide, bis(tris(pentafluorophenyl)alumane)-4,5-bis(undecyl)imidazolinide, bis(tris(pentafluorophenyl)alumane)-4,5-bis(heptadecyl)imidazolinide, bis(tris(pentafluorophenyl)alumane)-5,6-dimethylbenzimidazolide, and bis(tris(pentafluorophenyl)alumane)-5,6-bis(undecyl)benzimidazolide. Other activators include those described in PCT publication WO 98/07515 such as tris(2,2′,2″-nonafluorobiphenyl)fluoroaluminate. Combinations of activators are also contemplated by the invention, for example, alumoxanes and ionizing activators in combinations, see for example, EP-A-0 573120, PCT publications WO 94/07928 and WO 95/14044 and U.S. Pat. Nos. 5,153,157 and 5,453,410. WO 98/09996 describes activating catalyst compounds with perchlorates, periodates and iodates, including their hydrates. WO 99/18135 describes the use of organoboroaluminum activators. EP-A-781299 describes using a silylium salt in combination with a non-coordinating compatible anion. Other activators or methods for activating a catalyst compound are described in for example, U.S. Pat. Nos. 5,849,852, 5,859,653, 5,869,723, EP-A-615981, and PCT publication WO 98/32775. Another suitable class of organometal activators or cocatalysts are alumoxanes, also referred to as alkylaluminoxanes. Alumoxanes are well known activators for use with metallocene type catalyst compounds to prepare addition polymerization catalysts. There are a variety of methods for preparing alumoxanes and modified alumoxanes, non-limiting examples of which are described in U.S. Pat. Nos. 4,665,208, 4,952,540, 5,091,352, 5,206,199, 5,204,419, 4,874,734, 4,924,018, 4,908,463, 4,968,827, 5,308,815, 5,329,032, 5,248,801, 5,235,081, 5,157,137, 5,103,031, 5,391,793, 5,391,529, 5,693,838, 5,731,253, 5,731,451 5,744,656; European publications EP-A-561476, EP-A-279586 and EP-A-594218; and PCT publication WO 94/10180. Preferred alumoxanes are Lewis acid modified alumoxanes, especially tri(C3-6)alkylaluminum modified methylalumoxane, including tri(isobutyl)aluminum modified methalumoxane, available commercially as MMAO-3A or tri(n-octyl)aluminum modified methalumoxane, available commercially as MMAO-12, from Akzo Nobel, Inc. It is within the scope of this invention to use alumoxane(s) or modified alumoxane(s) as an activator or as a tertiary component in the invented process. That is, the compound may be used alone or in combination with other activators, either neutral or ionic, such as tri(alkyl)ammonium tetrakis(pentafluorophenyl)borate compounds, trisperfluoroaryl compounds, polyhalogenated heteroborane anions as disclosed in WO 98/43983, and combinations thereof. When used as a tertiary component, the amount of alumoxane employed is generally less than that necessary to effectively activate the metal complex when employed alone. In this embodiment, it is believed, without wishing to be bound by such belief, that the alumoxane does not contribute significantly to actual catalyst activation. Not withstanding the foregoing, it is to be understood that some participation of the alumoxane in the activation process is not necessarily excluded. Suitable alumoxanes include polymeric or oligomeric alumoxanes, especially methylalumoxane (MAO) as well as Lewis acid-modified alumoxanes, especially trihydrocarbylaluminum-, halogenated tri(hydrocarbyl)aluminum- or halogenated tri(hydrocarbyl)boron-modified alumoxanes, having from 1 to 10 carbons in each hydrocarbyl or halogenated hydrocarbyl group. Such activating cocatalysts are previously disclosed in U.S. Pat. Nos. 6,214,760, 6,160,146, 6,140,521, and 6,696,379, and elsewhere. Preferred Lewis acid-modified alumoxane compounds are tri(1-butyl)aluminum-modified methalumoxane and tri(n-octyl)aluminum-modified methalumoxane containing from 10 to 30, preferably 15 to 25 mole percent i-butyl content and 10 to 20, preferably 12 to 18 mole percent n-octyl contents, respectively, said molar percents based on total alkyl ligand content. The alumoxane or Lewis acid-modified alumoxane activator is preferably utilized in molar ratios cocatalyst:catalyst from 20-200, more preferably from 20-150, and most preferably from 20-80. Because of the ability to be activated at relatively low levels of alumoxane or Lewis acid modified alumoxane cocatalysts while maintaining high catalyst efficiency, the present zirconium complexes can achieve reduced levels of cocatalyst byproducts in the resulting polymer along with long chain branch formation in the resulting polymer. This in turn allows the polymers to be employed in demanding applications such as those requiring high clarity or low dielectric constant. In a preferred embodiment, the present process comprises polymerizing propylene, optionally ethylene, and further optionally a conjugated or nonconjugated diolefin using a group 4 metal complex and from 10 to 200 moles per mole of group 4 metal of an alumoxane, under continuous, solution polymerization conditions at a temperature from 120 to 250° C., preferably from 130 to 250° C., under high propylene conversion conditions (>85 percent, preferably >90 percent) to prepare a polymer comprising, in polymerized form, from 70 to 100, preferably 80 to 100 percent propylene, 30 to 0, preferably 20 to 0 percent ethylene, and 0 to 10, preferably 0 to 8, more preferably 0 to 7.5 percent diene. In general, monomer conversion may be determined by measurement of the reactor contents or of a representative stream of effluent exiting the reactor. Suitable methods for determining monomer concentration include infrared spectroscopy using a probe immersed in the reactor contents or a suitable sample thereof. One suitable technique uses Fourier Transform Near Infrared spectroscopy (FTNIR). Solids content of the reactor is calculated based on polymer (solids) produced or it may also be measured directly by use of viscosity or density measurements of the reactor contents. Multiple reactor polymerization processes may be suitably employed in the present invention. Examples include such systems as are disclosed in U.S. Pat. No. 3,914,342, among others. The multiple reactors can be operated in series or in parallel, with at least one catalyst composition according to the present invention employed in at least one of the reactors. One or both reactors may also contain at least two catalysts which have different comonomer incorporation capability and/or different molecular weight formation capability. In one embodiment, a relatively high molecular weight product (Mw from 100,000 to over 1,000,000, more preferably 200,000 to 500,000) is formed while in the second reactor a product of a relatively low molecular weight (Mw 2,000 to 300,000) is formed. Both of these reactor products can have similar or different densities and/or elastomer content. The final product is a mixture of the two reactor effluents which are combined prior to devolatilization to result in a uniform mixing of the two or more polymer products. In another embodiment, one reactor may be used to prepare a high molecular weight propylene homopolymer while the second reactor is employed to prepare a copolymer of propylene and ethylene or an interpolymer of propylene, ethylene, and one or more dienes. Such a dual reactor process allows for the preparation of impact modified products or products with tailored properties. In one embodiment, the reactors are connected in series, that is, the effluent from the first reactor is charged to the second reactor and fresh monomer, solvent and/or hydrogen is optionally added to the second reactor. Reactor conditions are adjusted such that the weight ratio of polymer produced in the first reactor to that produced in the second reactor is ideally in the range from 5:95 to 95:5. It will be appreciated by the skilled artisan that the foregoing dual reactor process is capable of producing polymers having broadened molecular weight distribution or polydispersity index (PDI). Preferred polymers made in the foregoing manner have PDI from 2.8 to 10.0, more preferably from 3.0 to 7.0. In a further embodiment, one of the reactors in the polymerization process, including the first of two reactors operating in series, contains a heterogeneous Ziegler-Natta catalyst or a chromium containing catalyst, such as one of the numerous such catalysts known in the art. Examples of Ziegler-Natta catalysts include, but are not limited to, titanium-based catalysts supported on MgCl2, and additionally comprise compounds of aluminum containing at least one aluminum-alkyl bond. Suitable Ziegler-Natta catalysts and their preparation include, but are not limited to, those disclosed in U.S. Pat. Nos. 4,612,300, 4,330,646, and 5,869,575. Suitable chromium based catalysts are those disclosed in U.S. Pat. Nos. 4,981,927, 4,835,219, 4,564,660, 4,173,548, 3,953,413, and elsewhere. Single reactor, multiple catalyst processes are also useful in the present invention. In one embodiment, two or more catalysts are introduced into a single reactor at the high monomer conversion conditions that are herein disclosed, wherein each catalyst inherently produces different polymer products. In one embodiment, a relatively high molecular weight product (Mw from 100,000 to over 1,000,000, more preferably 200,000 to 500,000) is formed from one catalyst while a product of a relatively low molecular weight (Mw 2,000 to 300,000) is formed from the other catalyst. Both of these catalyst compositions can have similar or different polymer formation ability, at least one of which comprises a metal complex as set forth herein. The resulting polymer will have properties dependant on the ratio of the two catalysts that are employed in the single reactor. Suitable combinations of polymer molecular weight, comonomer incorporation ability, processes, and ratios of catalysts for such products are disclosed in U.S. Pat. No. 6,924,342. Due to the unique compatibility of the present catalyst compositions with other olefin polymerization catalysts, including Ziegler/Natta catalysts, the second catalyst composition may comprise a metal complex as herein disclosed, a metallocene or other π-bonded ligand group containing metal complex (including constrained geometry metal complexes), or a polyvalent heteroatom ligand group containing metal complex, especially polyvalent pyridylamine or imidizolylamine based complexes and tetradendate oxygen-ligated biphenylphenol based Group 4 metal complexes. 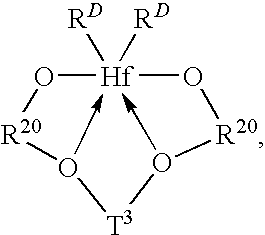 RD independently each occurrence is a monovalent ligand group of from 1 to 20 atoms, not counting hydrogen, or two RD groups together are a divalent ligand group of from 1 to 20 atoms, not counting hydrogen. 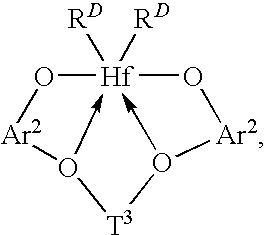 RD independently each occurrence is a monovalent ligand group of from 1 to 20 atoms, not counting hydrogen, or two RD groups together are a divalent ligand group of from 1 to 40 atoms, not counting hydrogen. RD, independently each occurrence is halo or a hydrocarbyl or trihydrocarbylsilyl group of up to 20 atoms not counting hydrogen, or 2 RD groups together are a divalent hydrocarbylene, hydrocarbadiyl or trihydrocarbylsilyl group of up to 40 atoms not counting hydrogen. RD, independently each occurrence is halo or a hydrocarbyl or trihydrocarbylsilyl group of up to 20 atoms not counting hydrogen, or 2 RD groups together are a hydrocarbylene, hydrocarbadiyl or hydrocarbylsilanediyl group of up to 40 atoms not counting hydrogen. wherein, RD independently each occurrence is chloro, methyl or benzyl. The foregoing metal complexes may be conveniently prepared by standard metallation and ligand exchange procedures involving a source of the transition metal and a neutral polyfunctional ligand source. The techniques employed are the same as or analogous to those disclosed in U.S. Pat. No. 6,827,976 and US2004/0010103, and elsewhere. The metal complex is activated to form the active catalyst composition by combination with the cocatalyst. The activation may occur prior to addition of the catalyst composition to the reactor with or without the presence of other components of the reaction mixture, or in situ through separate addition of the metal complex and activating cocatalyst to the reactor. Suitable olefin mixtures for use herein include mixtures of ethylene, one or more C3-30 α-olefins and one or more conjugated or nonconjugated dienes. Suitable α-olefin comonomers include, but are not limited to, propylene, isobutylene, 1-butene, 1-pentene, 1-hexene, 1-heptene, 1-octene, 1-nonene, 1-decene, and 1-dodecene, 1-tetradecene, 1-hexadecene, 1-octadecene, 1-eicosene, 3-methyl-1-butene, 3-methyl-1-pentene, 4-methyl-1-pentene, 4,6-dimethyl-1-heptene, and vinylcyclohexane. 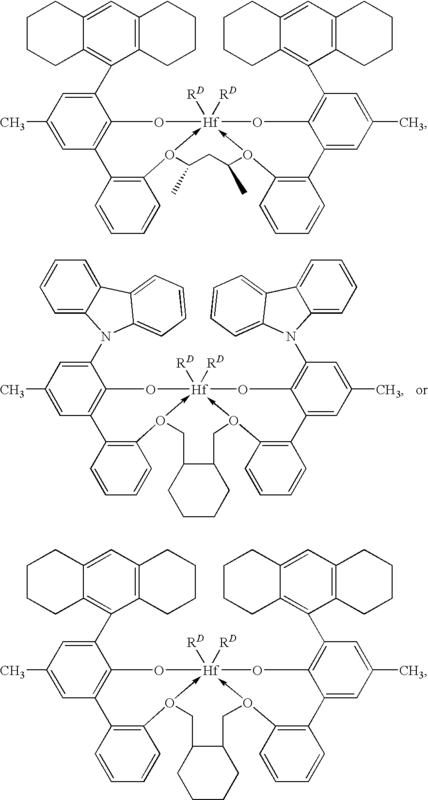 Suitable dienes for use herein include straight chain-, branched chain-, cyclic-, and polycyclic hydrocarbon dienes having from 6 to 15 carbon atoms. Examples of suitable non-conjugated dienes include, but are not limited to, straight chain acyclic dienes, such as 1,4-hexadiene, 1,6-octadiene, 1,7-octadiene, 1,9-decadiene, branched chain acyclic dienes, such as 5-methyl-1,4-hexadiene; 3,7-dimethyl-1,6-octadiene; 3,7-dimethyl-1,7-octadiene and mixed isomers of dihydromyricene and dihydroocinene, single ring alicyclic dienes, such as 1,3-cyclopentadiene; 1,4-cyclohexadiene; 1,5-cyclooctadiene and 1,5-cyclododecadiene, and multi-ring alicyclic fused and bridged ring dienes, such as tetrahydroindene, methyl tetrahydroindene, dicyclopentadiene, bicyclo-(2,2,1)-hepta-2,5-diene; alkenyl, alkylidene, cycloalkenyl and cycloalkylidene norbornenes, such as 5-methylene-2-norbornene (MNB); 5-propenyl-2-norbornene, 5-isopropylidene-2-norbornene, 5-(4-cyclopentenyl)-2-norbornene, 5-cyclohexylidene-2-norbornene, 5-vinyl-2-norbornene, and norbornadiene. Of the dienes typically used to prepare EPDMs, the particularly preferred dienes are 1,4-hexadiene (HD), 5-ethylidene-2-norbornene (ENB), 5-vinylidene-2-norbornene (VNB), 5-methylene-2-norbornene (MNB), and dicyclopentadiene (DCPD). The most especially preferred diene is 5-ethylidene-2-norbornene (ENB). In general, the polymerization may be accomplished at conditions well known in the prior art for olefin solution polymerization reactions. Preferred polymerization temperatures are from 80 to 250° C., more preferably from 100-200° C. Preferred polymerization pressures are from atmospheric to 3000 atmospheres (100 kPa to 300 MPa), more preferably from 1 MPa to 10 MPa. In most polymerization reactions the molar ratio of catalyst:polymerizable compound employed is from 10−12:1 to 10−1:1, more preferably from 10−11:1 to 10−5:1. Highly desirably, the reaction is conducted under continuous, solution polymerization conditions, that is, conditions wherein the monomer or monomers are continuously added to a reactor operating under solution polymerization conditions, and polymerized product is continuously or semi-continuously removed and recovered or forwarded to a second reactor. Desirably, the polymerization mixture comprises an aliphatic or alicyclic liquid diluent. Examples of such aliphatic or alicyclic liquid diluents include straight and branched-chain hydrocarbons such as isobutane, butane, pentane, hexane, heptane, octane, and mixtures thereof; alicyclic hydrocarbons such as cyclohexane, cycloheptane, methylcyclohexane, methylcyclo-heptane, and mixtures thereof; and perfluorinated hydrocarbons such as perfluorinated C4-10 alkanes, and the like. Small quantities of aromatic hydrocarbons such as toluene, ethylbenzene or xylene may be included as well, but are not preferred. Mixtures of the foregoing are also suitable. A preferred liquid diluent is a hydrogenated oligomeric aliphatic hydrocarbon mixture having a distillation, ASTM D 86, TBP of 118° C., distillation, ASTM D 86, Dry Point of 137° C., and Specific Gravity, 15.6° C., ASTM D 1250 of 0.72 sold commercially under the trade designation Isopar™ E, available from ExxonMobil Corporation. The use of molecular weight control agents or chain transfer agents in the present process is desired. Examples of such molecular weight control agents include hydrogen, trialkyl aluminum compounds, or other known chain transfer agents. Hydrogen is a most preferred molecular weight control agent or chain transfer agent. A particular benefit of the use of the present invention is the ability (depending on reaction conditions) to produce narrow molecular weight distribution ethylene/α-olefin interpolymers. Preferred polymers have Mw/Mn of less than 3.0, more preferably less than 2.6. Such narrow molecular weight distribution polymer products are highly desirable due to improved tensile strength properties as well as reduced levels of extractables and metal values. Without limiting in any way the scope of the invention, one means for carrying out the present polymerization process is as follows. In a stirred-tank reactor, the monomers to be polymerized are introduced continuously together with any solvent or diluent. The reactor contains a liquid phase composed substantially of monomers together with any solvent or diluent and dissolved polymer. Catalyst along with cocatalyst and optionally chain transfer agent are continuously or intermittently introduced in the reactor liquid phase or any recycled portion thereof. The reactor temperature may be controlled by adjusting the solvent/monomer ratio, the catalyst addition rate, as well as by use of cooling or heating coils, jackets or both. The polymerization rate is controlled by the rate of catalyst addition. Pressure is controlled by the monomer flow rate and partial pressures of volatile components. The ethylene content of the polymer product is determined by the ratio of ethylene to comonomer in the reactor, which is controlled by manipulating the respective feed rates of these components to the reactor. The polymer product molecular weight is controlled, optionally, by controlling other polymerization variables such as the temperature, monomer concentration, or flow rate of the previously mentioned chain transfer agent. Upon exiting the reactor, the effluent is contacted with a catalyst kill agent such as water, steam or an alcohol. The polymer solution is optionally heated, and the polymer product is recovered by flashing off gaseous monomers as well as residual solvent or diluent at reduced pressure, and, if necessary, conducting further devolatilization in equipment such as a devolatilizing extruder. In a continuous process, the mean residence time of the catalyst and polymer in the reactor generally is from 5 minutes to 8 hours, and preferably is from 10 minutes to 6 hours. Alternatively, the foregoing polymerization may be carried out in a continuous loop reactor with or without a monomer, comonomer, catalyst or cocatalyst gradient established between differing regions thereof, optionally accompanied by separate addition of catalysts and/or chain transfer agent, and operating under adiabatic or non-adiabatic solution polymerization conditions or combinations of the foregoing reactor conditions. Examples of suitable loop reactors and a variety of suitable operating conditions for use therewith are found in U.S. Pat. Nos. 5,977,251, 6,319,989 and 6,683,149.
wherein under operating conditions of the polymerization unreacted monomer or monomers are not separated from the remaining solvent of a reaction mixture prior to recycling of the reaction mixture. wherein the continuous solution process operates at a temperature from 120 to 250 ° C. and a pressure from 100 kPa to 300 MPa. 3. The process of claim 1 wherein the polymerization temperature is from 130 to 200 ° C.
4. The process of claim 1 wherein a monomer mixture consisting essentially of propylene and ethylene is polymerized. 5. The process of claim 1 wherein the cocatalyst is alumoxane present in an amount to provide a molar ratio based on Hf from 20:1 to 150:1. 6. The process of claim 5 wherein the alumoxane is tri(isobutyl)aluminum modified methylalumoxane or tri(n-octyl)aluminum modified methyalumoxane. D) bis((2-oxoyl-3-(1,2,3,4,6,7,8,9-octahydroanthracen-5-yl)-5-(methyl)phenyl)-2-phenoxymethyl)methylenetrans-1,2-cyclohexanediylhafnium (IV) dimethyl, bis((2-oxoyl-3-(1,2,3,4,6,7,8,9-octahydroanthracen-5-yl)-5-(methyl)phenyl)-2-phenoxymethyl)methylenetrans-1,2-cyclohexanediylhafnium (IV) dichloride, bis((2-oxoyl-3-(1,2,3,4,6,7,8,9-octahydroanthracen-5-yl)-5-(methyl)phenyl)-2-phenoxymethyl)methylenetrans-1,2-cyclohexanediylhafnium (IV) dibenzyl, bis((2-oxoyl-3-(dibenzo-1H-pyrrole-1-yl)-5-(methyl)phenyl)-2-phenoxymethyl)-methylenetrans-1,2-cyclohexanediylhafnium (IV) dimethyl, bis((2-oxoyl-3-(dibenzo-1H-pyrrole-1-yl)-5-(methyl)phenyl)-2-phenoxymethyl)-methylenetrans-1,2-cyclohexanediylhafnium (IV) dichloride, and bis((2-oxoyl-3-(dibenzo-1H-pyrrole-1-yl)-5-(methyl)phenyl)-2-phenoxymethyl)-methylenetrans-1,2-cyclohexanediylhafnium (IV) dibenzyl. MX2011012938A (en) * 2009-06-05 2012-01-27 Dow Global Technologies Llc Process to make long chain branched (lcb), block, or interconnected copolymers of ethylene. MX357976B (en) * 2011-12-13 2018-08-01 Dow Global Technologies Llc Ethylene-propylene-diene interpolymer composition. MX2015016913A (en) * 2013-06-28 2016-04-04 Dow Global Technologies Llc Hyperbranched ethylene-based oligomers. MX2018004335A (en) 2015-10-29 2018-05-22 Dow Global Technologies Llc Crosslinkable polymeric compositions for flexible crosslinked cable insulation and methods for making flexible crosslinked cable insulation. EP0608369A1 (en) 1991-10-15 1994-08-03 Dow Chemical Co Elastic substantially linear olefin polymers. DZ520A1 (en) 1982-03-24 2004-09-13 Union Carbide Corp An improved process for increasing the space time yield of an exothermic polymerization reaction in the fluidized bed. FR2656314B1 (en) * 1989-12-22 1992-04-17 Bp Chemicals Snc Catalyst zirconium supported on magnesium chloride, process for the preparation and use of the catalyst in olefin polymerization. FR2705252B1 (en) * 1993-05-19 1995-07-21 Bp Chemicals Snc A method of introducing a solid into a reactor and related apparatus. DE69720823T2 (en) 1996-01-25 2004-01-22 Tosoh Corp., Shinnanyo A process for olefin polymerization using a transition metal catalyst. MXPA03004961A (en) * 2000-12-04 2004-04-02 Univaton Technologies Llc Polimerization process.